FILE - Security issues are expected to dominate the African Union Summit. As more Nigerian towns come under attack by Boko Haram, '#Bring Back Our Girls' campaigners show support for the missing Chibok schoolgirls at a rally in Abuja, Nov. 3, 2014. As the African Union Summit kicks off Friday here in Ethiopia’s capital, women’s empowerment and development serve as the official theme, with the 2015 elections and the Ebola fight also commanding attention. But as usual, peace and security issues – such as the ongoing violent attacks by Nigerian militant group Boko Haram – top the agenda covering hundreds of meetings over the next week. 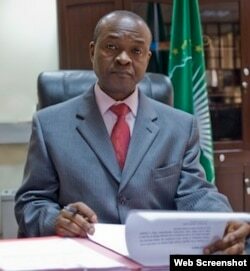 FILE - Erastus Mwencha is the African Union Commission’s deputy chairman. Erastus Mwencha, the African Union Commission’s deputy chairman, said further union action depends on what the countries' representatives say during the summit. "If you look at the heinous crimes that have been committed by Boko Haram, if you see the extent to which it is now spreading its tentacles to other parts of the region beyond Nigeria, it calls for intervention," he said. "But that also rests on the countries there requesting [help]. … If there is a request, then of course the African Union will intervene." A special regional summit on South Sudan’s conflict also will be held on the sidelines of the AU meeting, as little progress has been made so far in halting the violent conflict. The East African bloc Intergovernmental Authority on Development has been mediating the process. It will present a report and, based on that, further actions will be taken next week. Meanwhile, protests in the Democratic Republic of the Congo broke out after its president, Joseph Kabila, was believed to be trying to change the maximum term limit. His second five-year term expires in 2016. With more than 10 elections on the continent this year, Mwencha said the AU is involved in trying to ensure peaceful elections. "We try to make sure we have long-term observers on the ground to help member states address some of the challenges that could frustrate having a free and fair outcome of an election," Mwencha said. The AU also tries to have "a mechanism that could enable the parties to dialogue" to avoid conflict, he said. "And we do intervene on that, constantly." Assessing responsiveness to the Ebola outbreak – one of the major crises on the continent last year – will be a significant agenda point, Mwencha said. He said participants will consider lessons learned, preparedness and response. The summit will conclude with a two-day meeting of heads of state January 30 and 31. Is South Sudan's Fractured SPLM Party Poised to Reunite?